The legendary deaf baseball player remains a role model and inspiration today. Los Angeles, Calif. — May 17, 2012 — On May 23, 1862 William “Dummy” Hoy was born in Houcktown, Ohio and 150 years later the lessons he taught us still stand true. Despite a challenge that was considered debilitating in the 1800’s, “Dummy” Hoy taught us to believe in ourselves, never take no for an answer and if you stick to your path, anything is possible. 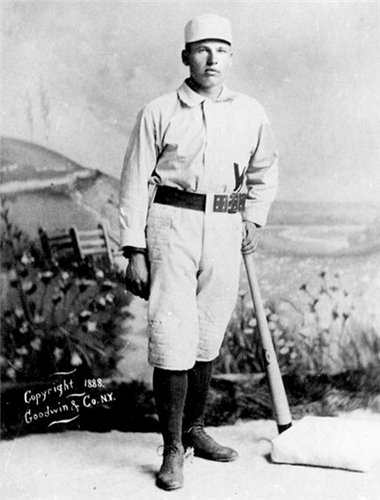 Dummy Hoy rose to become one of the best professional baseball players at the turn of the 20th Century, in spite of being deaf, speaking impaired and of small stature. Hoy became deaf at the age of three from spinal meningitis. He became known as “Dummy” as the word “dumb” was used to describe someone who could not speak. Originally the term “dummy” or “dumb” was not necessarily connected with someone who was stupid. However, since the inability to speak was often seen as a reflection on intellect, the terms have come to suggest someone with a lack of intelligence. Hoy was far from unintelligent and proud of his name; in fact he would correct people that called him William. After graduating as valedictorian from the Ohio State School for the Deaf he played professional baseball for 14 years. From 1888 to 1902 Hoy played center field for eight teams in four major leagues. He held many major league records for his play in center field, along the base path and at the plate. For example, his feat of throwing out three base runners at home plate from center field, unassisted, in a single game is a record that still stands today, 125 years after he retired. Hoy is also credited by many with bringing hand signals to baseball — players and fans still benefit from this today. Hoy’s story is one of honesty, character, humility, living with passion and persistence, setting and achieving goals, and executing a game plan. It also provides important awareness as to what it is like for people with disabilities to succeed in society. He passed away at the age of 99 in 1961 and was inducted into the Cincinnati Reds Hall of Fame in 2003. “I See the Crowd Roar – The Story of William ‘Dummy’ Hoy” is narrated by Emmy Award winning sports commentator and journalist, Roy Firestone. It is a documentary about William “Dummy” Hoy who overcame the inability to hear or speak, giving him the nickname “Dummy” which he used proudly until his death in 1961. “I see the Crowd Roar” is an inspirational and true story of one of the greatest (hearing or hearing impaired) baseball players of all time. For more information visit: http://www.iseethecrowdroar.com/. This entry was posted in General on May 19, 2012 by Scott.